Takashi Mikouchi graduated from the Geology and Mineralogy course in the University of Tokyo’s Department of Geocciences in 1993, after which he advanced to the Mineralogical Institute in the Graduate School of Science. That same year, he was a summer intern at the NASA Johnson Space Center. He became an assistant professor in 1995, and obtained his Ph.D. in Science in 1998. He became an assistant professor in the Department of Earth and Planetary Science in 2000, and later an associate professor, before taking up his current position in 2011. Earth was born at about the same time as the rest of the solar system, around 4.5 billion years ago. The Earth has three main layers—the crust, mantle, and core—and the mantle and core are highly active. The mantle is composed of partially molten rock, which sometimes erupts to the surface and covers it. Earth’s surface also changes due to erosion by wind and water. The oldest rocks found to date are around 4.3 billion years old, and there are nearly no remnants of the Earth from before this time. Professor Mikouchi says that our best evidence of what the solar system was like just after the Earth was born comes to us from outside our planet, in the form of meteorites. Planetoids are small objects that did not manage to build up to planetary size. They are no longer active, and have no atmosphere, water, or volcanism, and so represent an imprint of what the solar system was like just after it was born. In a sense, they are like a compressed file containing information about the young solar system. The knowledge and techniques of mineralogy and crystallography allow us to decompress that information. The time when meteorites were formed is also important information. Professor Mikouchi is putting effort into learning more about the evolution of planetary materials, which allows us to examine the evolution of the Sun and planets by following changes in meteorite composition over the ages. The Mikouchi Laboratory is actively involved in research coordinated with scientists from around the world. 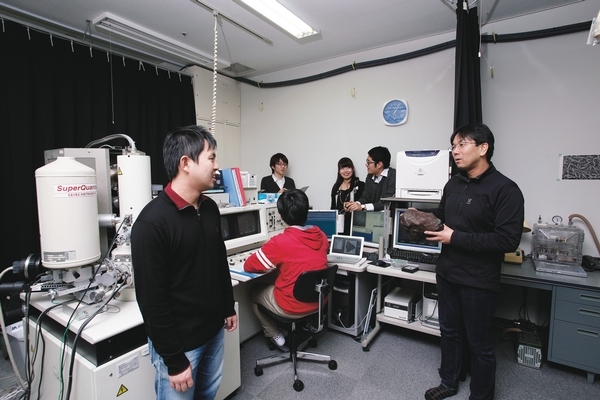 There are few meteorite researchers who specialize in mineralogy and crystallography, so the lab is often called upon by researchers in other fields. Saori Yoshida (B4) has been involved in an international project analyzing a meteorite that fell in February 2013 near Chelyabinsk, Russia. Yuya Aoyagi (M2) is performing research along with a team in the United States, and Akira Hasegawa (B4) is doing the same with a team in Denmark. Each student is actively engaging with the world as a true researcher. The laboratory enjoys a long, deep relationship with NASA in particular. There have been connections between NASA and department instructors since Professor Mikouchi was a student here himself, as when he was in graduate school, he held intern and postdoctoral positions there. Current students as well frequently visit NASA. Atsushi Takenouchi (M1), who interned at NASA last summer, describes the differences in research styles he experienced there: “Researchers would go home at 3:00 pm, but they still came up with results.” Wataru Satake (D4) performed research for several weeks alongside top scientists visiting Japan from NASA. Meteorites are things we can see in front of our own two eyes, yet can help us learn about the mysteries of space. Professor Mikouchi and his students agree that being able to hold these relics from space is one of the most exciting parts of this research. 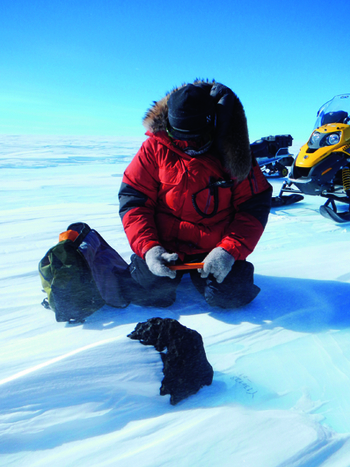 The Antarctic is a prime location for meteorite hunting. The photograph is from when Professor Mikouchi joined the 54th Japanese Antarctic Research Expedition to search for meteorites. Even in the middle of summer, the highest temperature was still –15 °C, and the winds were around 10 m/s. It was a harsh environment, but we collected about 420 meteorites, around 75 kg in all. 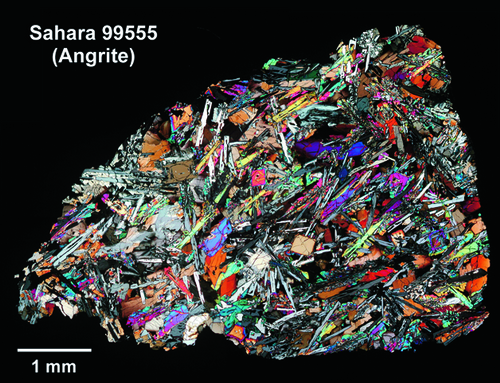 A polarized light micrograph of the solar system’s oldest igneous rock (from an angrite meteorite).